We’re embarking on a journey to transform and modernise our IT services and our ways of working through close collaboration and partnerships. We’re achieving this by passionately embracing new technology and empowering multi-disciplined teams to deliver ambitious strategic objectives through creativity, innovation and forward thinking. Read our candidate pack for more information. We’re passionate about continuous improvement and strive to assess and implement the latest techniques, toolset, technology and architecture to benefit the charity. We’re looking for people who share our passion, innovation and drive to deliver the best possible service to our colleagues and clients. People are at the heart of what we do, so you’ll need to share our values, behaviours, and be on board with our vision. Working within the Infrastructure team you will get the opportunity to work with a range of popular technologies stored both on premise as well as within the cloud. Where possible we are always looking to keep up to date with market trends and technologies and we want you to be an integral part of this investigation and implementation. Within the Infrastructure team we cover a variety of tasks including network management, server maintenance and upgrades, network and infrastructure security and telephony. This is where you’ll get to work on defining the architecture for the charity and help us to realise our strategic objectives. To do this, you’ll have opportunities to work with subject matter experts from across the charity as well as our highly skilled IT teams. Roles in architecture are focussed on designing systems that are flexible, maintainable and secure whilst meeting user needs and the charity’s long-term objectives. At StepChange Debt Charity we concentrate on producing high quality testing that meets the requirements of our charity using the most appropriate tools and techniques. Working in a fun yet professional environment you will be involved in ensuring the testing is the most efficient and effective that it can be. We have three teams, which develop and maintain the applications for specific areas of the charity. We have a strong team ethic, where we support each other in our personal development. We engage in change and projects from concept through to warranty, in which we constantly demonstrate our ability to deliver high quality solutions on time. Roles in Service Delivery are varied, rewarding and challenging on a daily basis. In joining IT Service Delivery you’ll be part of a fast-paced team that delivers everything from the system changes that make a difference to our clients and colleagues to managing incidents and third-party relationships. IT Service Delivery at the charity doesn’t stand still and we are always looking for opportunities to automate processes that deliver improved IT services across the whole portfolio. If you want to help us transform the lives of those struggling with debt have a look at our latest roles. 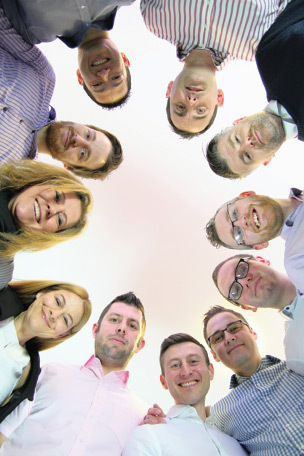 Meet some of our IT specialists and discover more about their roles. Discover our wide range of benefits, including financial, emotional and physical support.